With more than three decades of clinical experience and over a million patients treated, statistics confirm a success rate of greater than 95 percent for individual dental implants*, and even higher for the bridges they support. 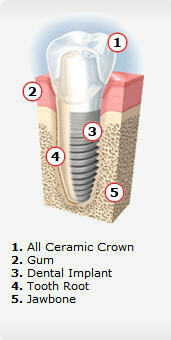 In some cases, your dentist can place your dental implant. However, if he or she isn’t familiar with dental implants you may be referred to a periodontist like Dr. Hughes for this procedure.